I wasn't feel great this weekend so I didn't get to do a whole lot with VSN which I am really sad about. This is a card I made for the first challenge, it was a sketch challenge and you were supposed to put something you LOVE on the card. I hadn't made Brady's Valentine's card for his baby book yet so this is it. This is one of my absolute favorite pictures of Brady, look at that sweet face! 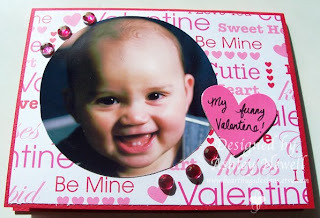 This card was SUPER easy, it took under 10 minutes to make and I just love the way it turned out! It's a perfect little addition to Brady's baby book! I used a chipboard heart and hand wrote on it. And I used clear rhinestones and colored them with red Sharpie to make them match. Easy peasy! This is the most adorable card! What a super cute picture of Brady! Thanks for the idea to color clear rhinestones with Sharpies.